I can’t tell you how many people have said the Newcomers Club has saved their life coming here. Many don’t know anyone at first and then find a fantastic group of friends! That includes me. I never really had many women friends before because working and raising a family consumed most of my time. Now I have more wonderful friends than I ever knew was possible and so many enjoyable things to do that I can’t possibly fit them all in! Others have left behind many dear friends and are now seeking new friends to fill that hole in their life. 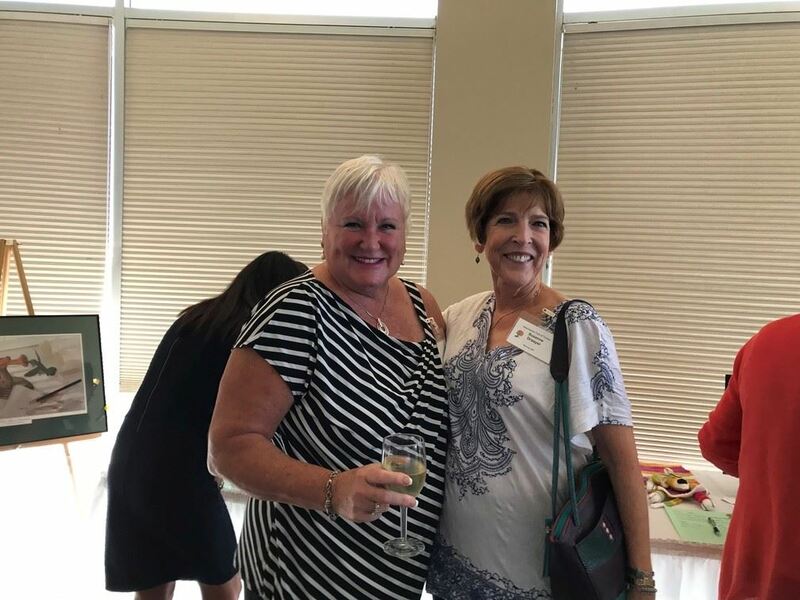 Newcomers provides a place to start, grow and enjoy friendships. We had over 250 activities on our scheduled calendar last year. Plus 10 book clubs, most meeting monthly. 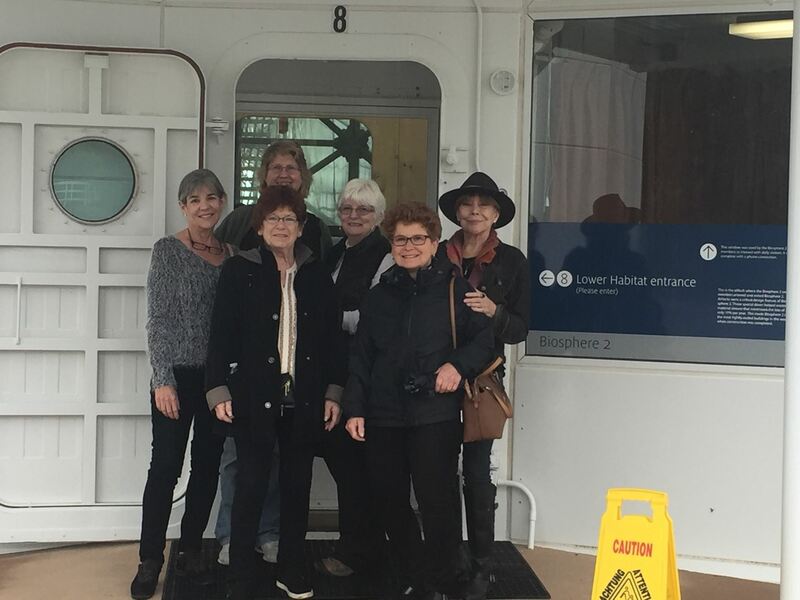 Several of the book clubs have a theme, such as non-fiction or history, and biographies. 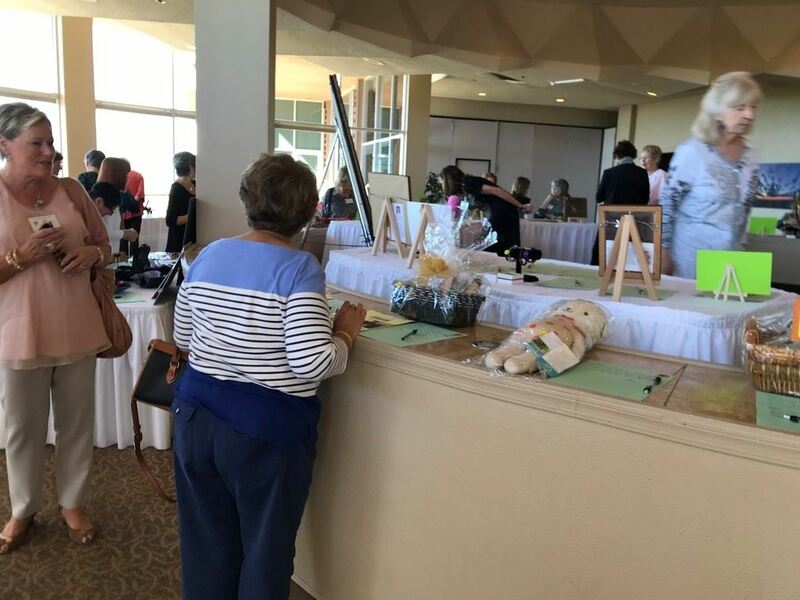 There are another 100 events of regularly scheduled groups like golf and bridge. See our Activity page for more details. 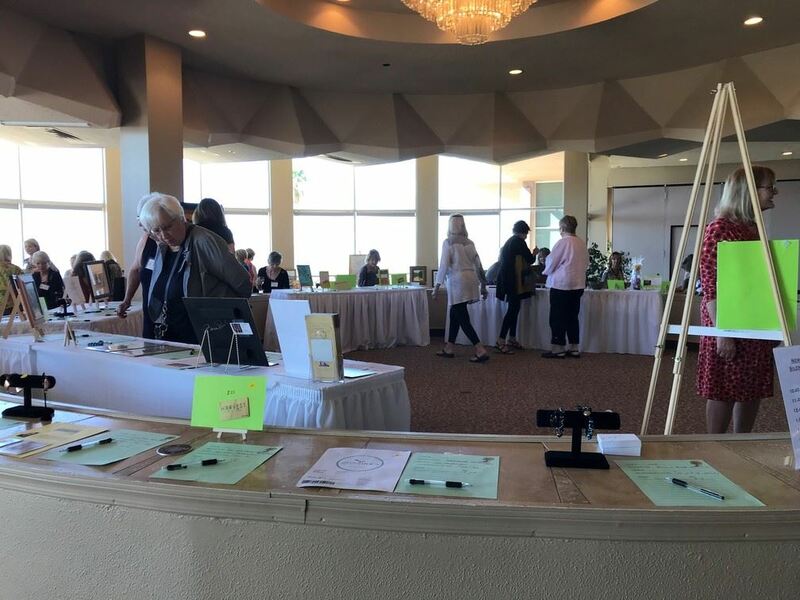 Nearly 100 people volunteer to make this all happen: our Board, who makes decisions and manages the budget on behalf of the club and Activity Chairs who put together the many different things to do throughout the year. 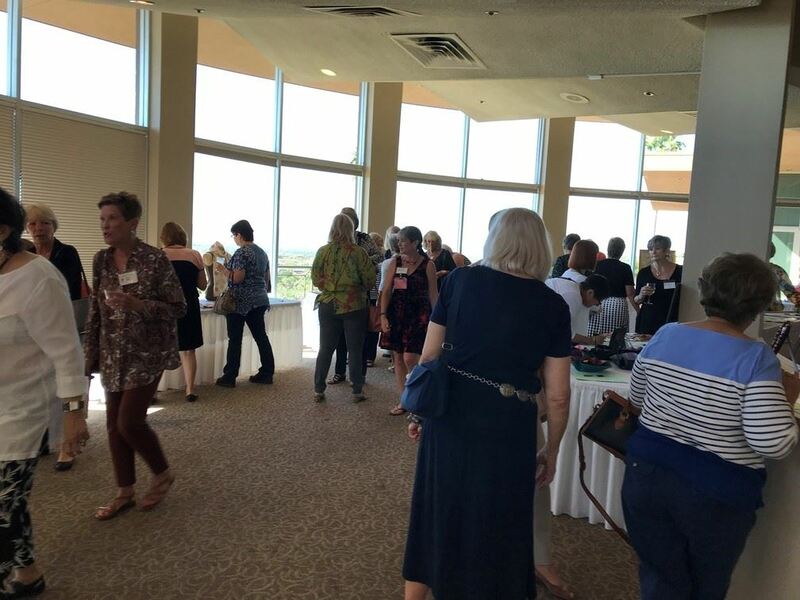 There are many options to run a program for a regular group of women (such as a book club, bridge or golf), or for an always different group of people to meet (like Ladies Night out, hiking, or card games). 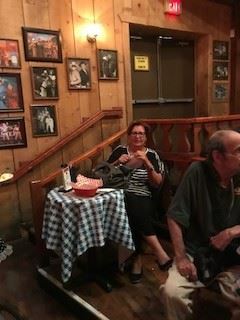 If you aren’t ready to jump in, we have little “bites” for those who aren’t ready to run a whole program, but would lead just a single activity and pair up with a more experienced member. This is a great way to get to know the club and provide the most valuable part of our offering. Many people in a new life situation are looking for something fulfilling to do. In addition to helping run the club, volunteering for the community is a good way to get engaged. We look to support a local charity that serves women and children. 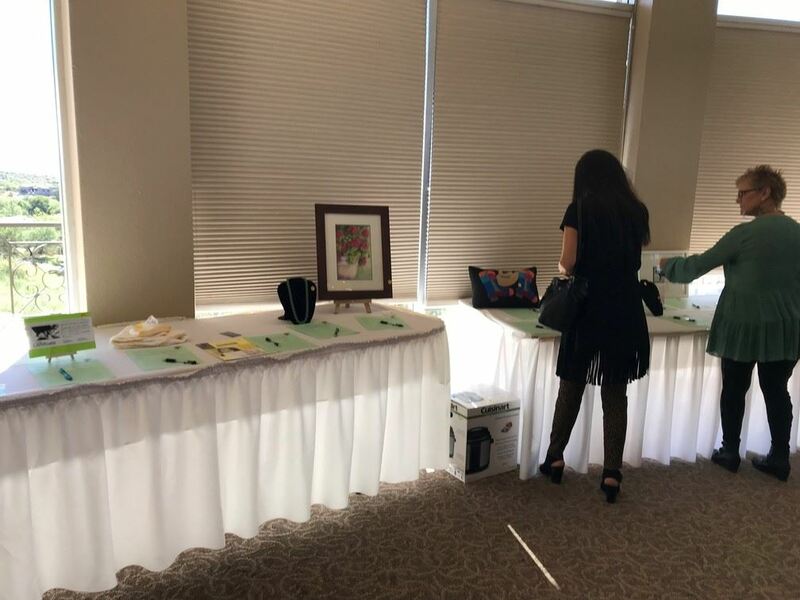 This year and next it will be Single Mom Scholars (SMS) an organization serving young women who are raising children on their own, have had some college, and desire to complete their studies. SMS is seeking to break the cycle of poverty by enabling these women to graduate and obtain well-paying jobs, and model this behavior for their children. I hope you will seriously consider joining our club and I look forward to meeting you at a future event. The Hiker Chicks bagged a peak! Wasson Peak, in the Tucson Mountains was our destination. It was a beautiful spring day and we covered the 8 miles and 1716' climb in just a couple of hours. We saw quite a few mine openings, and the beginnings of some wildflowers. The view across valleys all the way around was stunning. 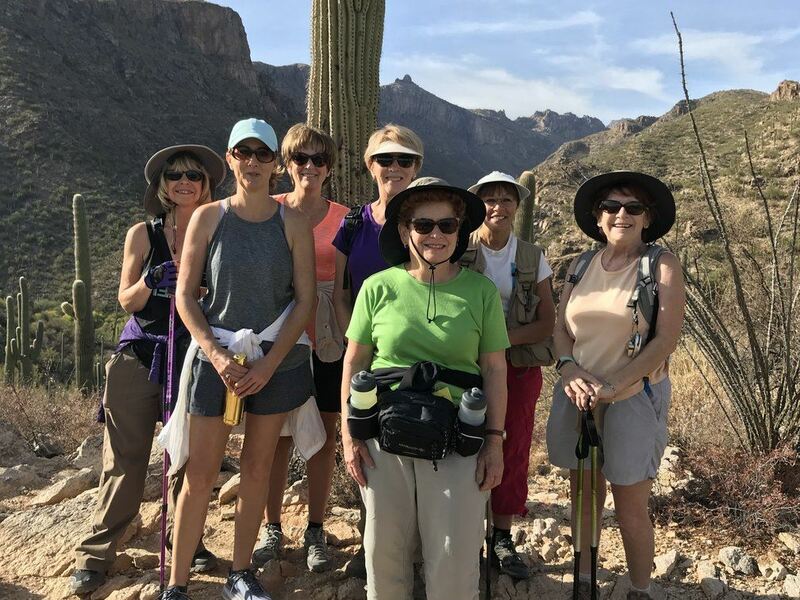 Seven hiker chicks met on a beautiful morning, at Catalina State Park. We were rewarded with lots of colorful wildflowers, birds, other friendly hikers and a good workout! 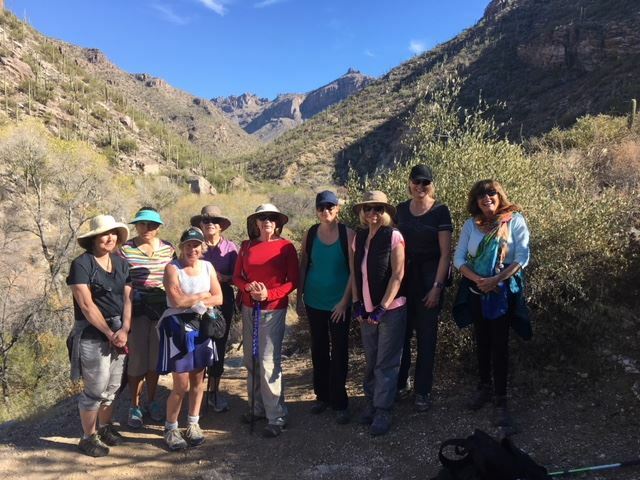 The Hiker Chicks took one of the most famous Level 4 hikes - to the top of Blackett's Ridge in Sabino Canyon. It was a 1700' climb (135 stories high). Two of us accomplished this hike for the first time. Three others were first-time Hiker Chicks. It was a perfect day. 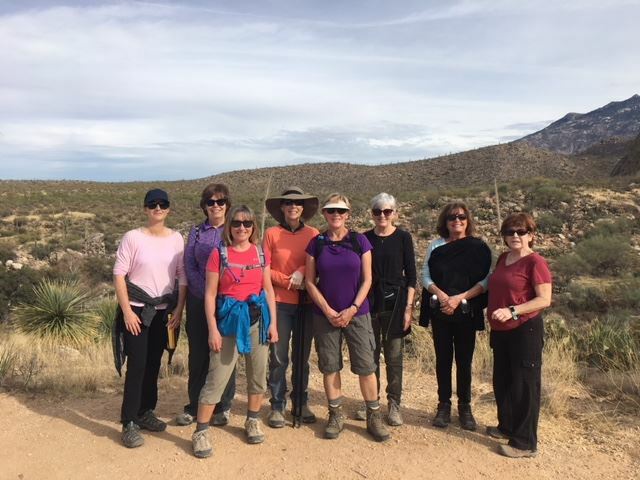 Twelve Hiker Chicks met at Saguaro National Park West to hike to the Signal Hill Petroglyphs and hike the Cactus Wren Loop. Most southwestern rock art pre-dates modern written history and had its origins hundreds, perhaps thousands of years ago, created by the people of this region. Most of the rock art found in Saguaro National Park was created by the prehistoric Hohokam and is in the form of petroglyphs. These are created by etching, pecking or scraping designs into the dark patina found on the surface of sandstone and other rocks. Both representational and abstract designs can be seen in Hohokam petroglyphs. Representational images are often animals, humans and astrological objects. Abstract designs take many forms, including spirals and squiggly lines. We do not know what these petroglyphs mean. They could have religious or ceremonial significance. They may be solstice markers, clan symbols, decorative motifs, or simply ancient graffiti. Environmental conditions and visitors take their toll on the rock art. 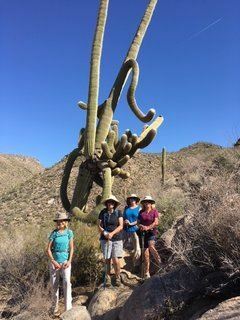 Fortunately, Saguaro National Park has an active program to monitor the condition of this and other cultural resource sites. 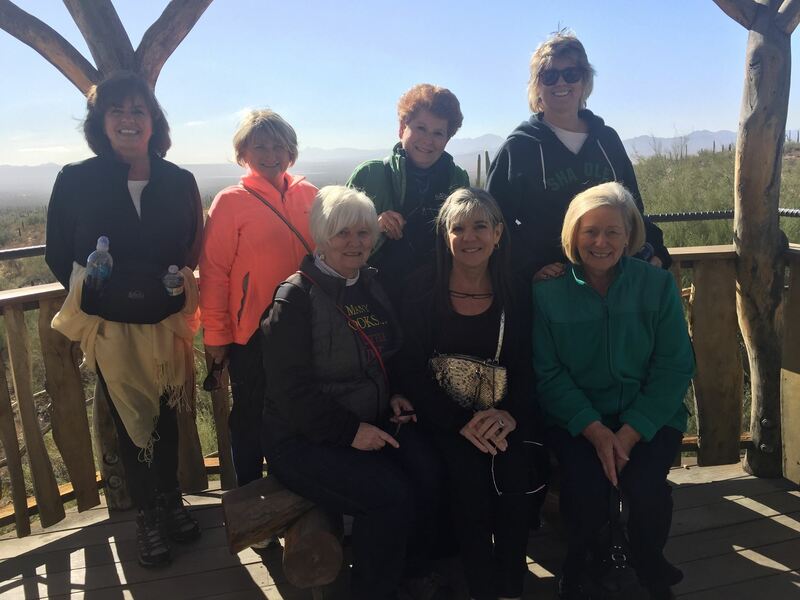 Six hardy hikers completed a 4 mile hike at Dove Mtn in Marana. Starting by the Ritz Carlton Resort, our hike lead us through the Tortolita Mtns. Starting on the Wild Burro trail we walked through a wash which lead to the Lower Javelina Trail. 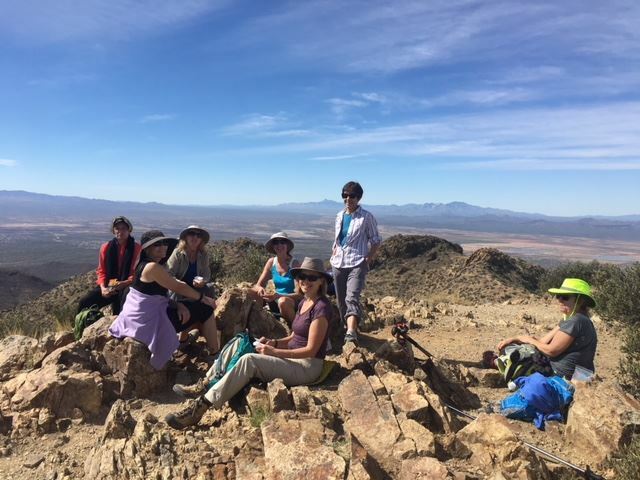 The Lower Javelina Trail is a rugged trail with 360' feet of elevation change which provided a good workout for the group. On the Lower Javelina Trail there were beautiful views to the southwest of the resort and the 2,400 acre Tortolita Preserve. It was another lovely day in Tucson for a hike at Sabino Canyon. Led by our leaders, we walked from the Visitors’ Center to the tram road toward Bear Canyon, and caught the Phoneline trailhead. We hiked up the Phoneline trail, past Blackett’s Ridge trailhead. Continuing a short way on the Phoneline trail, we then took the Phoneline cut-off on the left of the trail. This trail has a handful of switchbacks, and is reputed to be a favorite hangout for mountain lions. Rather than head toward the Sabino tram road, we took the trail to the left, which took us past the currently dry Sabino Dam and Creek. We then headed back to the visitors’ center to complete our sweet 4.3 mile hike. Things really warmed up today on our hike up the Canyon Loop, at Catalina State Park. Our group of 8 managed to do the hike and take in some beautiful scenery (and take a pic or 10). Thank you to our leader for the great hike! 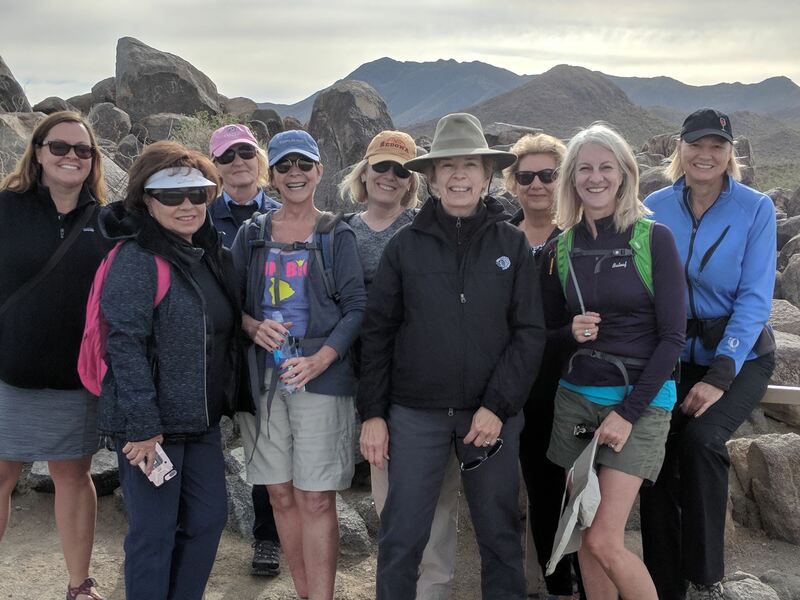 Hiker Chicks had a great time traversing the 2.5 mile Linda Vista Loop Trail. Rocky terrain made for an interesting “watch your footing” type of hike. The mild climb and easy pace created a pleasant level 2 hike enjoyed by the group of 14. 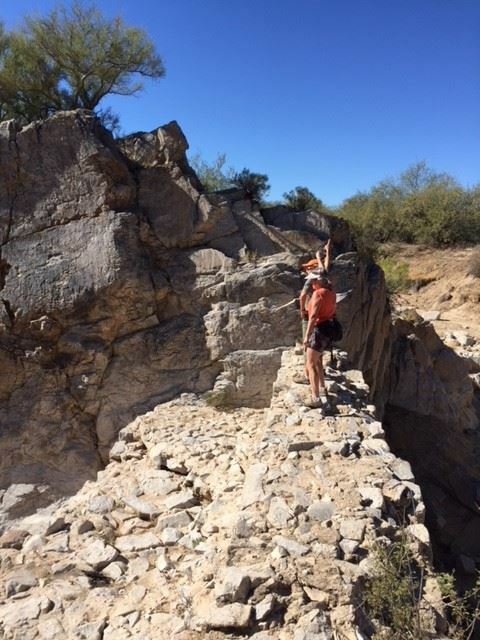 The popular trail, with awesome views of Oro Valley and the Pusch Ridge rock formations, called for several stops to take in the views! It was a perfect day for the perfect hike! 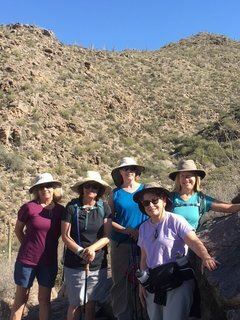 Eight Hiker Chicks enjoyed a leisurely loop hike in always beautiful Sabino Canyon on the Esperero/Rattlesnake trail on a perfect Southern Arizona Fall day. Our leader pointed out the best places for views and pictures and for a quick snack before walking back to the Visitor's Center. 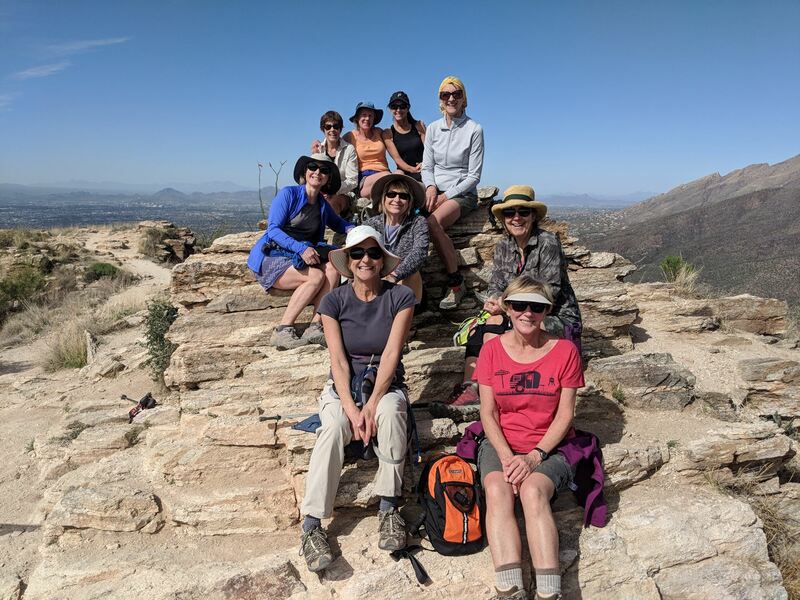 Eight Hiker Chicks mastered the Catalina Canyon Loop hike. Beautiful views of the mountains had us stopping to take pictures while enjoying the camaraderie that comes from hiking together. Our leader carefully pointed out the trail markers we needed to be aware of, to stay on the correct course and hike easily to the end. It was a scenic hike enjoyed by all! 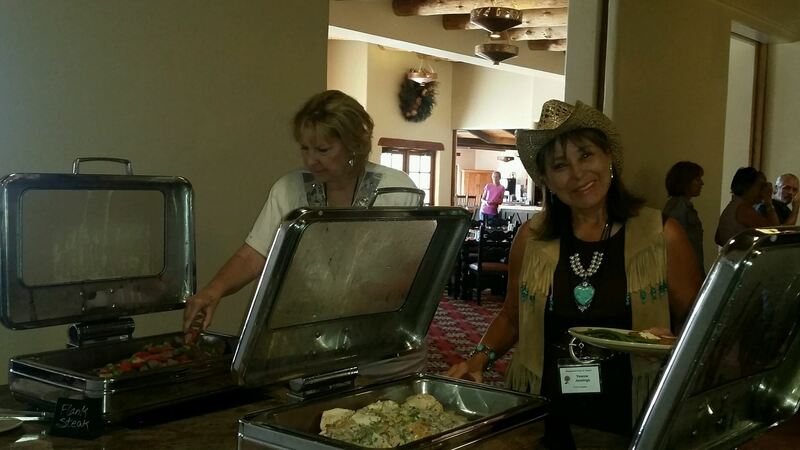 Over 100 people, many dressed in their Western best, enjoyed socializing and eating a tasty buffet luncheon at Tanque Verde Ranch. 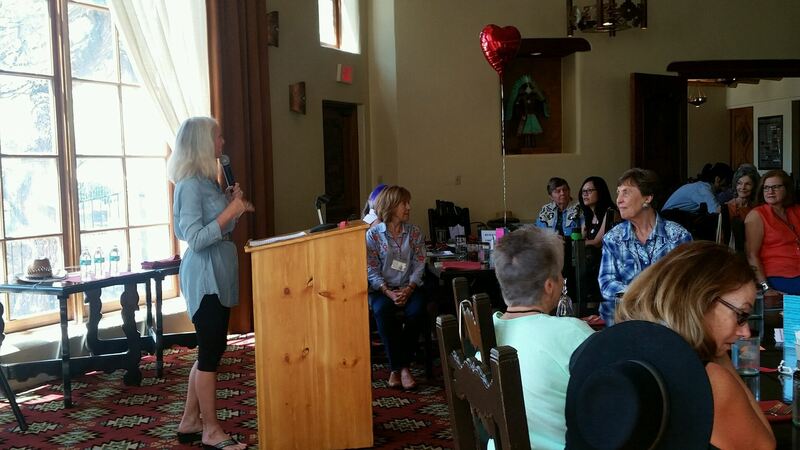 Glenda Bonin, a nationally known storyteller, presented the early life story of Dusty Vail as a young girl growing up in the early 1900s on one of the largest cattle ranches in West, Empire Ranch. 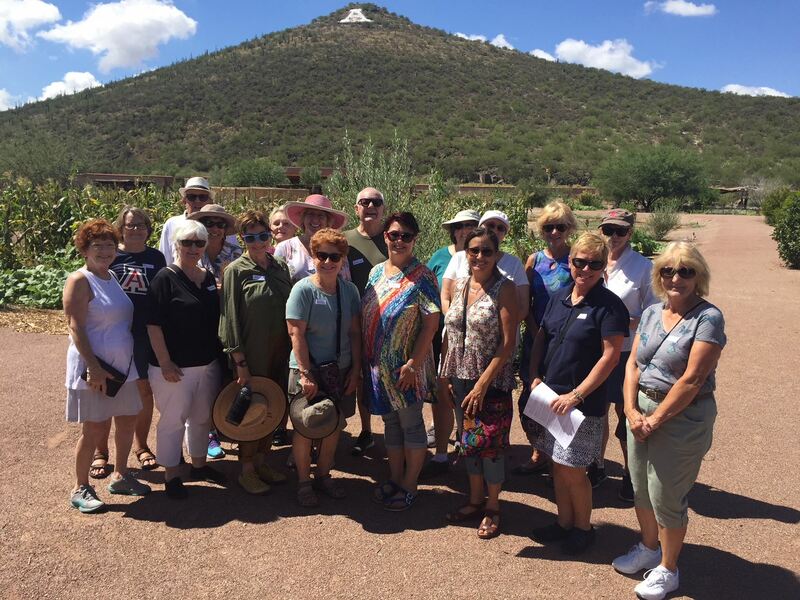 We had a nice, big group attend the Museum Tour at Mission Garden. 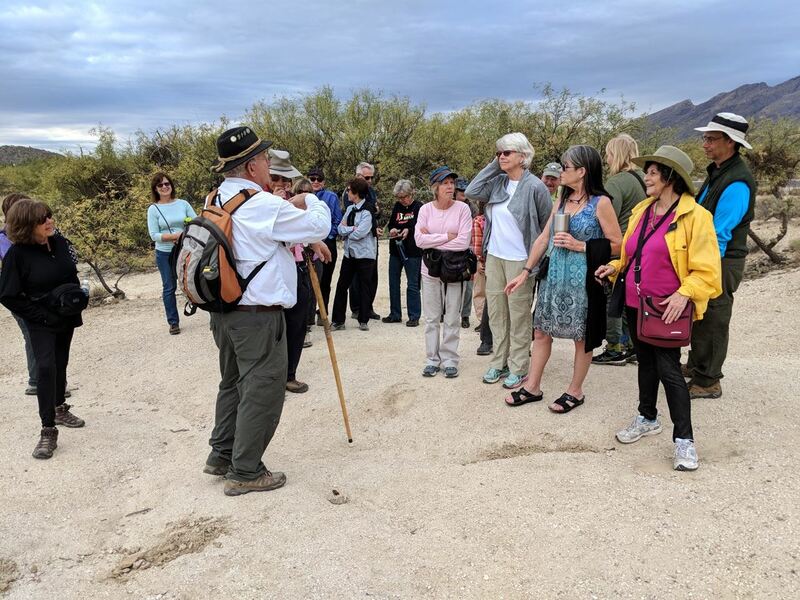 The weather was perfect and our docent was incredibly knowledgeable about all the different types of native plants and the origin of the non-native plants. The garden has been cultivated for 4000 years and is just amazing. They have all kinds of interesting festivals and special events coming up so please check out the website http://www.tucsonsbirthplace.org/ and try to attend one or all! Soon we are heading south for a tour of the Mission San Xavier del Bac. This should be another fantastic, historical tour of one of our area's most beautiful missions. Next tour will be The Museum of the Horse Soldier and after that is the 390th Squadron Memorial inside the grounds of the Pima Air & Space Museum. 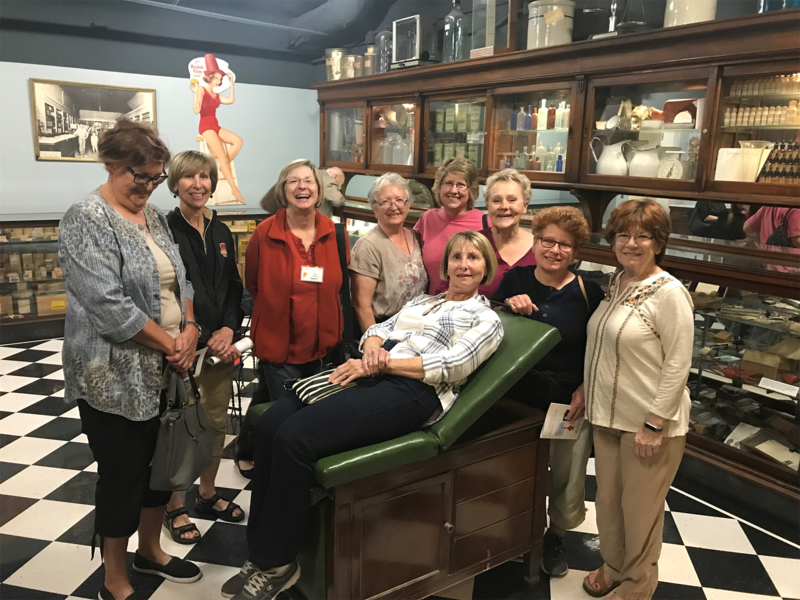 We toured the U of A Pharmacy Museum. What a fascinating afternoon! Our docent, the museum curator, regaled is with fabulous stories about the development of the modern pharmacy from its origins in partly mystical apothecary. The display of artistic hand blown glass bottles to outrageous advertising was really fun. While we were there the local PBS station was filming our docent in action so if you watch PBS you might see and hear some of us too! This is another treasure and we encourage everyone to visit this museum. We had a private tour of the facility and it was absolutely fascinating! There are so many scientific achievements and continuing experiments taking place and it was really fun to learn about them! 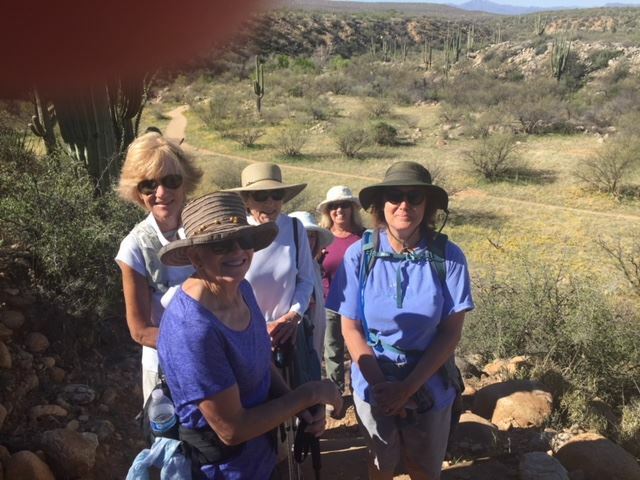 Newcomer members, spouses and guests walked about 2 miles in the lower Sabino Canyon and learned about the area geology and plant life. 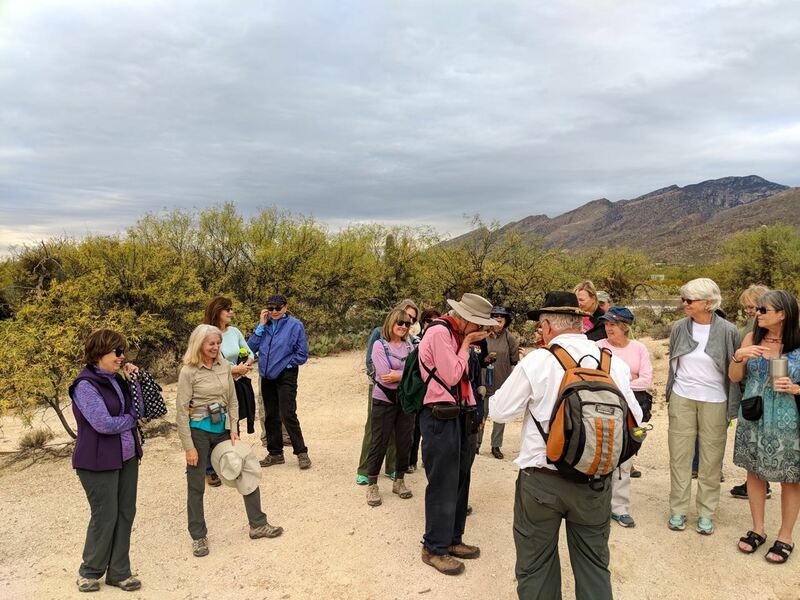 This walk/talk was planned and put on by the Sabino Volunteer Naturalists If you want to hear an interesting story, find a member who attended and ask them about 'fox on a rock'!!! One additional tool you might consider adding to your backpack for desert hiking is Nair. 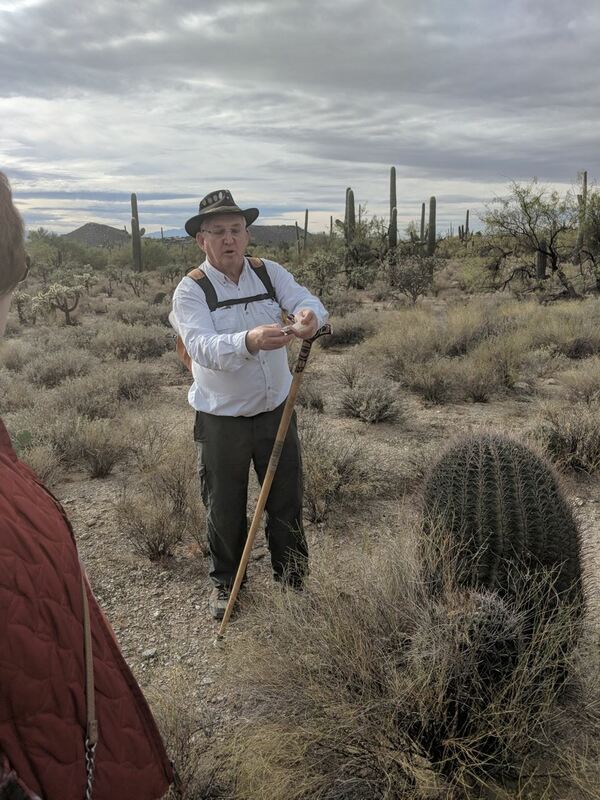 According to the naturalist who led the tour, it can be useful for dissolving cactus needles that at too small to tweeze, if it is applied promptly. If you missed the event, don't despair. There are several upcoming geology events offered to the public in the park each week. You can find them on the Sabino Canyon Calendar on their website. 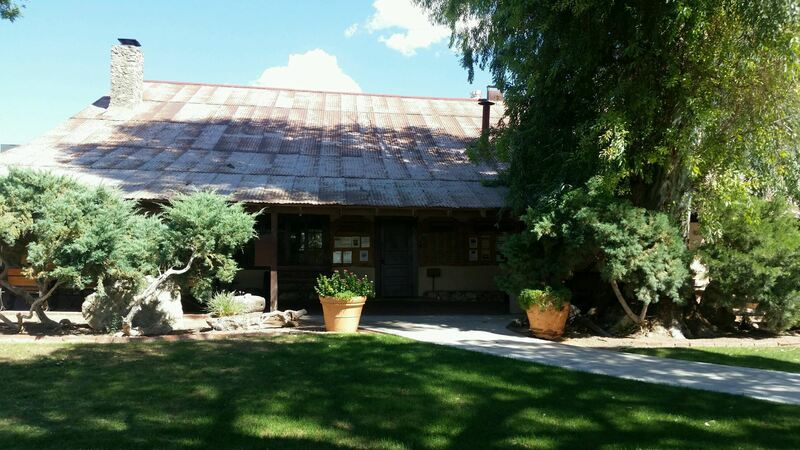 We had an amazing visit to the Sonoran Desert Museum in December. It was chilly but our docent was so knowledgeable, we hardly noticed. We learned about all the different types of plants in the different areas of our desert and saw some regal and amazing animals. We got to put jojoba (pronounced ho-ho-ba) oil ( but really it's a wax) on our hands and learned it takes four male jojoba plants to fertilize one female jojoba. We totally enjoyed the raptor free flight show and had to duck a couple of times as Harris Hawks came within inches of our heads! 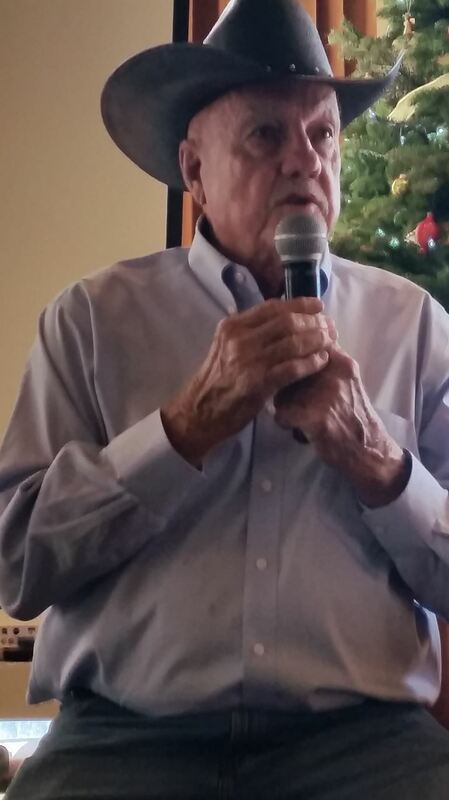 We enjoyed a wonderful buffet lunch at Tanque Verde Ranch and a very interesting speaker, H Allen Day. He recounted many great memories of growing up on the 200,000 acre Flying J Ranch and the time he spent taming a herd of Mustangs in South Dakota. 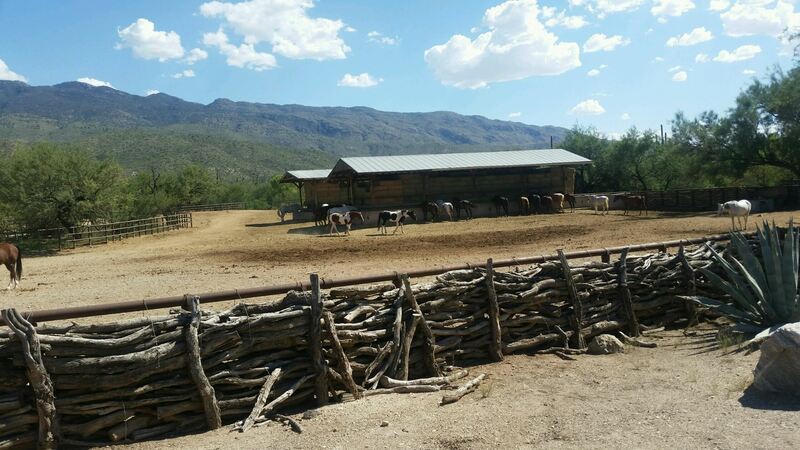 Additionally many Newcomers dressed in western wear to enhance the western theme of dining at Tanque Verde Ranch. After lunch, several members took time to pet the horses in the corral. generating over $4600 for the local charity that we support. Everyone had a great time supporting a great cause. 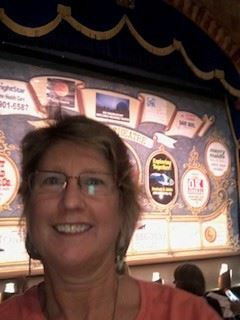 A group went to the Gaslight Theater for their super-fun version of Phantom of the Opera. We all laughed so hard we almost cried. Even the cast was having so much fun they had trouble keeping a straight face on stage. It was so great!